This card is entered into this month's Crazy Crafters Team Highlights. Click here to see all of the entries and vote for your favourites. A multipurpose card, suitable for either male or female recipient. I just love that owl! I really don't like to waste anything - especially paper and cardstock! So after I'd cut out the branch from the Smoky Slate for another card (I'll be sharing it on Sunday 2 September), I used the negative space for this card! The layers in the card are Smoky Slate and Basic Black and one of the layers has been embossed with the gorgeous Woodland Embossing Folder - still one of my favourites! 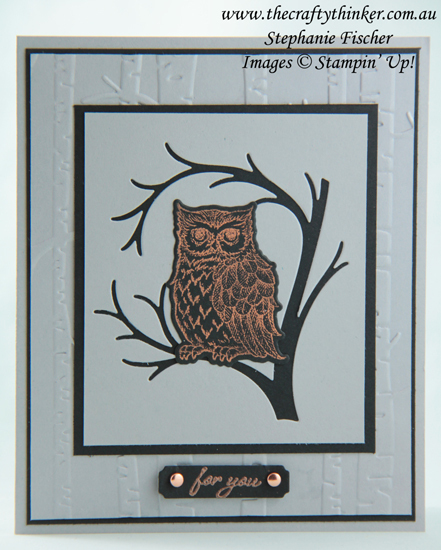 I stamped the owl with Bright Copper Shimmer Paint - I used the spatula end of the tool to place some shimmer paint on a sponge brayer and then rolled the paint onto the stamp. The greeting, from the Graceful Garden stamp set, is copper heat embossed and I cut it out with one of the Merry Christmas Thinlit dies and added some copper Metallic Brads before adhering it to the card with mini Stampin' Dimensionals. The Still Night Bundle will be available from 5 September 2018 to 2 January 2019 in the new Holiday Catalogue.